Snowdon is a great mountain to climb. It has a good mixture of walking and small scrambles. 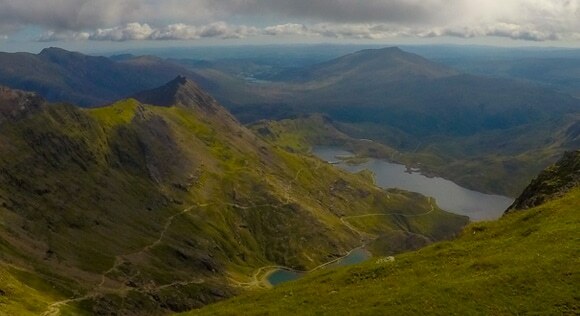 Snowdon is popular among hikers and is crowded in the summer months. Another appealing point of Snowdon is the circular route. Climbing up the Pyg Track and coming down the Miners Track adds variety to the climb. Parking at Pen-y-pass is difficult. It’s such a small car park for the number of visitors Snowdon receives. If you are lucky enough to secure a car parking space, the cost is £10 for the day. If the Pen-y-pass car park is full, there are multiple park-and-ride services nearby. The car park attendants are helpful and will point you in the right direction. A large park-and-ride service is Maes Parcio Car Park (view in Google Maps). Maes Parcio Car Park has toilets and taxis are present before the bus service starts. Both the taxis and bus cost approximately £2 per person. It is a short bus/taxi journey from Maes Parcis Car Park to Pen-y-pass, but it is a long walk (3 miles). 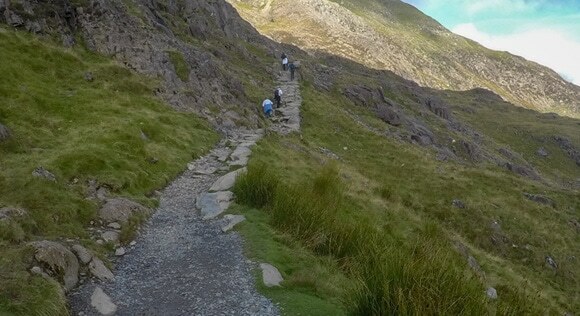 There are multiple routes to the summit of Snowdon that vary in difficulty. 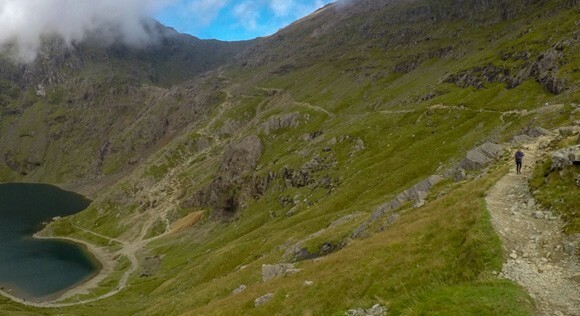 For the National Three Peaks Challenge, or as a first-timer to Snowdon, the recommended route is to hike up Snowdon using the Pyg Track and come back down using the Miners’ Track. You can use the same route to ascend and descend Snowdon, but using the two different route provides variety and a change of scenery. Returning down the Miners Track has the added benefit of a flat terrain to finish. About an hour of the Miners’ Track is completed on level ground as you walk back to the Pen-y-pass Car Park. 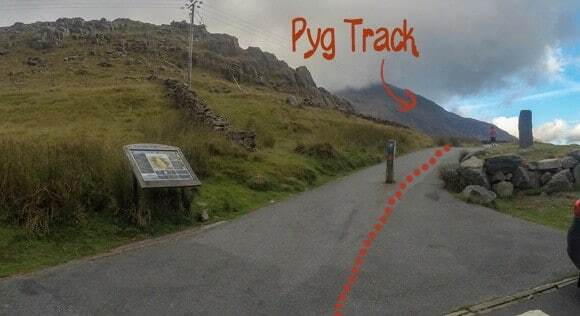 The Pyg Track and Miners’ Track start and finish in the Pen-y-pass Car Park. To start the walk up the Pyg Track, head to the right corner of the Pen-y-pass Car Park. After a short walk on the Pyg Track you are greeted by steps. The start of the Pyg Track involves a lot of steps, but you have the added bonus of scenery. From the very start of climbing Snowdon, you have undisturbed views of Snowdonia. 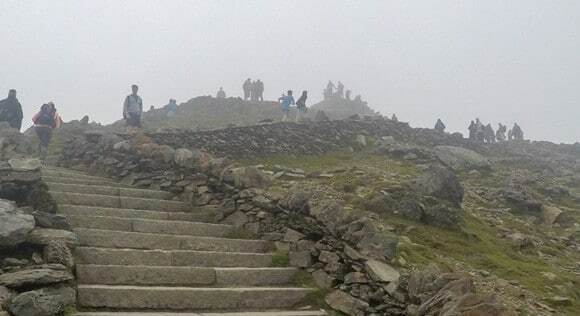 Snowdon’s hike has more variety compared to Scafell Pike and Ben Nevis: there are scrambling sections, lots of steps and some gentle inclines. The scrambling isn’t too difficult, but it can slow you down, especially as Snowdon is the most visited mountain of the National Three Peaks. 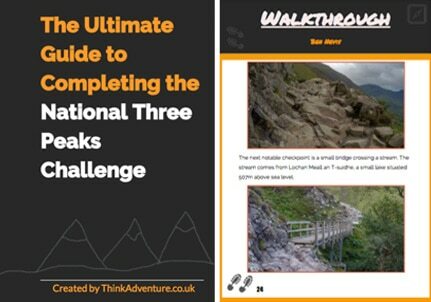 During peak times you may find yourself waiting for fellow walkers to pass areas that require scrambling. You will reach a cross section with a stone post labelled “Yr Wyddfa Snowdon.” Turn right and follow the level path, don’t follow the route with an incline. 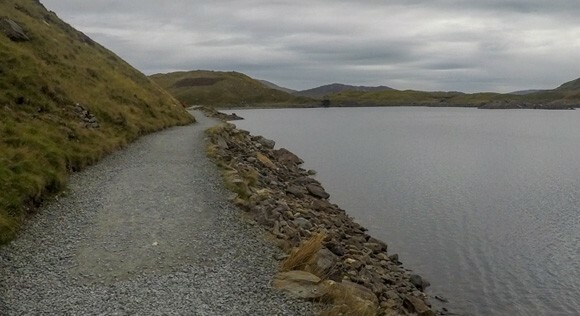 Along the route you can see the large lake, Llyn Llydaw, and the Miners’ Track that you will follow back to the Pen-y-pass car park. 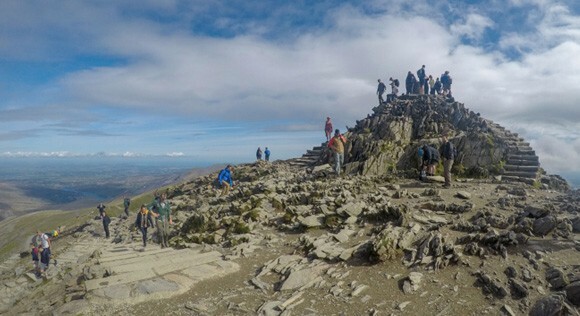 The popularity of Snowdon is a double-edged sword: it is difficult to get lost because of the large amount of other walkers climbing Snowdon, but you may be slowed down from the amount of foot traffic. 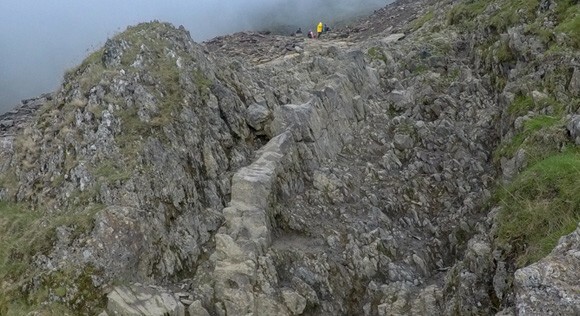 The clear route for Snowdon is reassuring and you can often see the path leading to the summit throughout the hike. 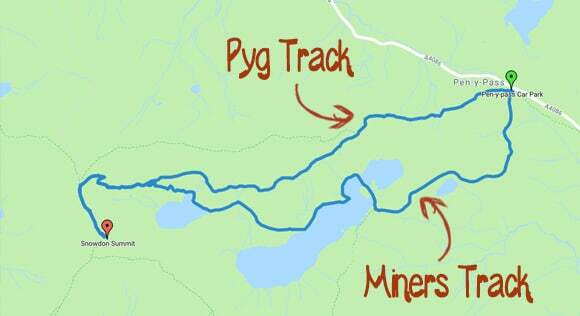 A good checkpoint is where the Pyg Track and Miners’ Track meet. A stone pillar highlights the meeting point. 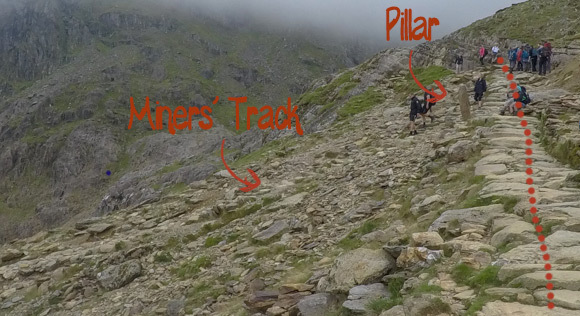 Make a mental note for your return journey; this is an important turn for the Miners’ Track. There is a lot of scrambling from this point. 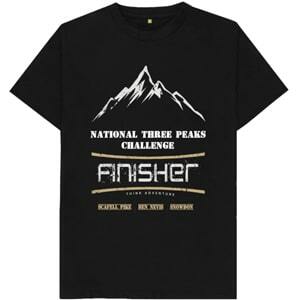 It doesn’t require any special climbing skills or equipment but it can be tiring of those unaccustomed to the terrain. It can be slippery after rainfall; take your time and be careful. There is a money tree along the route. A collection of coins has been added over the years to the tree stump. It’s not an official signpost but it confirms that you are nearly at the final section of Snowdon’s summit. The next turn is a left turn on to the Snowdon Ranger Path. 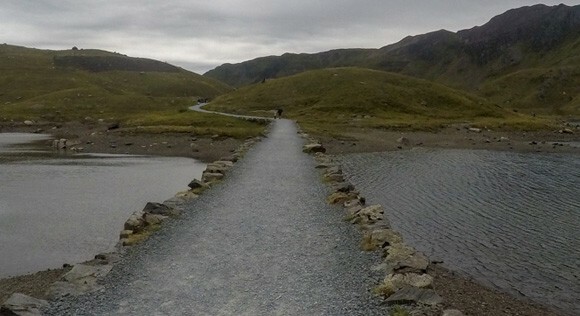 This path is the final ascent to Snowdon’s summit. This is the first time you will see the train line. The Ranger Path has great panorama views of Snowdonia if you are lucky enough to avoid the clouds. The path from here is parallel to the train track and leads to the summit. Visibility can be poor depending on the clouds but it is an easy path to follow, especially if you can see the summit in the background. Just keep walking with the train line on your right-hand side. The trig is easy to locate as it is on a platform directly from the path. There are two spiral stairs leading to the trig. You can see from the photographs that Snowdon has a lot more foot traffic compared to the other mountains. The trig is often crowded but you’ll have a chance to grab your photograph and celebrate the (almost) end of the National Three Peaks! 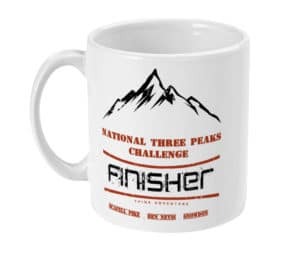 There’s just the anti-climatic return to the car park before you can truly celebrate the end of the National Three Peaks. Head back the way you came. Both staircases from the trig lead to the track. Walk down the trail with the railway on your left-hand side. 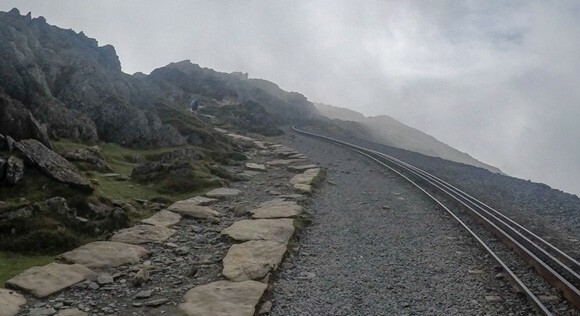 You will reach the point where the Pyg/Miners’ Track breaks away from the Snowdon Ranger Path. This turn is highlighted by a large stone pillar. Turn right. The next important turn is for the Miners’ Track. A helpful stone pillar highlights the split from the Pyg Track. The Miners’ Track is a steep decline but you reach level ground quickly. The final stretch of the Miners’ Track is on level ground. It is still a long walk back to the Pen-y-pass Car Park. It winds around and through the lake. 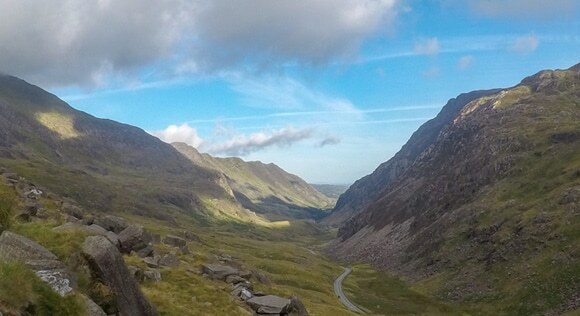 It is a gentle and scenic route to finish the climb of Snowdon. 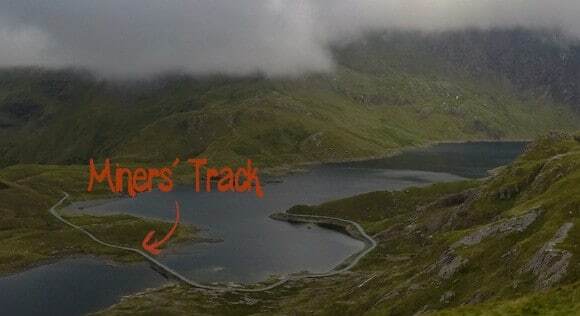 The Miners’ Track leads all the way back to the Pen-y-pass Car Park.